A woman cut out of her mother's will has been awarded a £164,000 inheritance in what could prove to be a landmark ruling. Heather Ilott, of Ware, Hertfordshire, went to court after her mother Melita Jackson left her £486,000 estate to animal charities when she died in 2004. The Court of Appeal has ruled she should receive a third of the estate. The ruling could significantly weaken people's right to leave money to those they want to inherit it, it is thought. The court heard Mrs Ilott, 54, had eloped at the age of 17 with her boyfriend and, as a result, her mother had never forgiven her and did not want her to receive a penny of her estate. It was left to the RSPCA, RSPB and Blue Cross charities. Mrs Ilott later married her partner. They have five children and the court heard Mrs Ilott planned to use the inheritance to buy their housing association home. When Melita Jackson died in 2004 she made it crystal clear she didn't want her estranged daughter Heather Ilott to benefit, and so left her estate to animal charities with which she had little connection. The relationship between mother and daughter soured when, aged 17, Heather eloped with her future husband. Yesterday she was awarded a third of the estate because her mother hadn't left "reasonable provision" for her in the will. She'll now be able to buy her housing association property and won't lose her state benefits. Experts say the ruling means you can still disinherit your children but you'll have to explain why and what connects you to those you do leave money to. That'll make it easier for adult "disinherited" children to challenge wills and claim greater sums by way of reasonable provision. Mrs Jackson made her last will in 2002 with a letter to explain why she had disinherited her only daughter, referring to the fact she had walked out of her home in 1978 to live with her boyfriend. Mrs Ilott, who was an only child born two months after her father died in an accident, had in 2007 won the right to an inheritance of £50,000 after a district judge concluded she had been "unreasonably" excluded by Mrs Jackson. That ruling was reversed, before Appeal Court judges ruled she was entitled to a share of the money. Media captionThe BBC's Clive Coleman: "People will need to show they have real connection with a charity"
2002: Melita Jackson makes her last will with a letter to explain why she had disinherited her only daughter, referring to the fact that she had walked out of her home in 1978 to live with her boyfriend. 2004: Mrs Jackson dies aged 70. 2007: Heather Ilott, her daughter, challenges the will under the Inheritance (Provision for Family and Dependants) Act and is awarded £50,000 on the basis she had been "unreasonably" excluded by her mother. But when she applies for a larger share of the money, a High Court judge reverses the decision to award it to her in the first place. 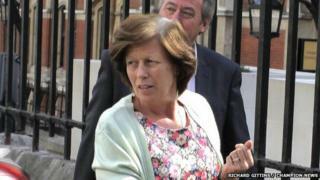 2011: The Court of Appeal rules Mrs Ilott is entitled to a share of the money after all. 2014: Mrs Ilott loses a battle to get a larger share of the money at the High Court - a decision which has now been successfully challenged at the Court of Appeal. When Mrs Ilott appealed to get the amount increased, Mrs Justice Parker dismissed this at the High Court in London, ruling in March 2014 that the previous decision that £50,000 was appropriate could not "be said to be wrong". However, in the latest hearing Lady Justice Arden said Mrs Ilott's mother had been "unreasonable, capricious and harsh" and ruled she should receive a greater proportion of the estate. In a joint statement, the three charities said they were "surprised and disappointed" by the judgement. David Mitson from Gisby Harrison Solicitors, who made Mrs Jackson's will, said he could not comment on the latest development because of client confidentiality. A builder who cleaned an elderly man's gutters for free was left £500,000 when the pensioner died, but faced a court battle to keep the money, the London Evening Standard reported.